What is Cash Reserve Ratio: Let’s discuss here what is Cash Reserve Ratio, SLR Rate, Repo & Reverse Repo Rate? Cash Reserve Ratio is a method used by a central bank to manage liquidity in banking system. The purpose of CRR is to ensure that banks will not run out of cash to fulfill the payment demands of customers. The higher the CRR tax ratio, the bank can use the same amount of credit and can be used for investment. The CRR has to be maintained in the form of cash in the Reserve Bank of India. The minimum ratio is stipulated by the RBI and is known as CRR. What is Current CRR & SLR Rate, Repo & Reverse Repo Rate!!! Recently, the Current Bank Rate is 6.75 % and Cash Reserve Ratio (CRR) is 4 % and Statutory Liquidity Ratio (SLR) is 19.50 % and Repo Rate (RR) is 6.50 % and last Reverse Repo Rate (RRR) is 6.25 %. Cash Reserve Ratio is a system of Reserve Bank of India to maintain monetary policy. Cash Reserve Ratio (CRR) is a fixed part of the total deposit of the customer, which is reserved as a deposit with the central bank. CRR is used in India from time to time according to the need to control currency supply. The CRR has been determined based on the guidelines of the central bank of one country (Reserve Bank of India). Current Cash Reserve Ratio (CRR) is 4%, the Reserve Bank of India does not pay interest on the Cash Reserve Ratio. For Example: CRR is 6%, a person has 500 rupees in his bank Deposits. Since the CRR is 6% and 6% of the 500, it is Rs. 30, so the bank has to keep Rs.30 with the RBI and only 500-30%. = 470 Money must be made or given as a loan by the bank. 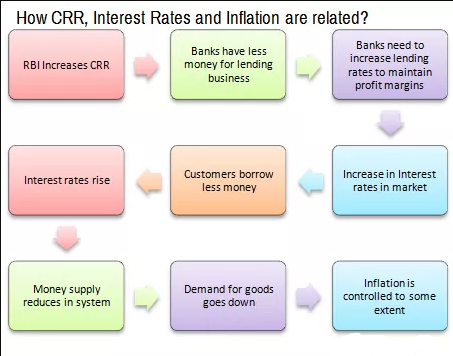 Why RBI uses cash reserve ratio (CRR)? For the need of economic development, RBI uses CRR to control currency supply in the market. The increase and decrease of the cash reserve ratio controls the currency supply in the market. Reserve Bank of India uses cash reserve ratio to curb inflation and regulates inflation. To provide employment - A reduction in CRR may help young people to get loans with low interest rates, which can provide them employment opportunities, because availability of funds is high when CRR is low. CRR helps to provide loans to farmer’s reduction in cash reserve ratio enables banks to provide more money for agriculture. The full form of SLR is Statutory Liquidity Ratio. Every bank has to invest some proportion of its deposit amount in the financial securities of central government or state government. This ratio is known as SLR. This deposit is mainly invested in government securities (bonds), cash, gold and non-approved, which means banks can earn 'interest' to some extent on these investments rather than the CRR. SLR is determined based on time liabilities and percentage of total demand. Time liabilities, banks are responsible for paying customers with mutual consent after a certain period, and demand liabilities are such deposits of customers who are payable on demand. Example of time liability - Term Deposit which is not payable on demand, but is payable only after the scheduled time. Example of demand liability is deposited in a savings account or current account, which is payable on demand - such as checks. For Example: You say deposit is 500 rupees in your bank then the bank gets Rs 500 and the RBI has to pay a percentage with the SLR. If the existing SLR is 20% then they will have to invest 100 rupees in government securities. SLR is usually used to increase or decrease inflation. The repo rate is the rate at which the RBI lends money to banks for a period of time. And in a bank repo transaction, the RBI repurchases the government securities from the banks and receives money in the exchange. Due to cut in repo rate, banks get money at cheaper rates, while increasing the repo rate makes RBI borrowing more expensive. If it makes banks cheaper to borrow money, then it reduces the repo rate. The reverse repo rate is the short-term borrowing rate on which the country's central bank (the Reserve Bank of India) takes money from commercial banks within the country. It is a monetary policy system that is used to control currency supply in the country. All the entries of the loan card should be in the local language. No penalty will be imposed on delayed payment. The major dissimilarity between the Repo Rate and Reverse Repo Rate is that Repo Rate is the interest rate at which the commercial banks borrow loans from RBI, while Reverse Repo Rate is the rate at which the RBI borrows loan from the commercial banks. The Repo Rate is always higher than the Reverse Repo Rate. Here all banking terms are clearly mention in simple words with images. Aspirants can go through provided information about Cash Reserve Ratio, Statutory Liquidity Ratio, Repo Rate and others. If you face any difficulty or have any query related to above mentioned you can simply comment us on below mentioned comment box our team will soon reply towards it.